Learning a trick shot in pool is like learning a card trick: the beauty is in the nonchalance, the delivery of a perceived impossibility with a natural grace. And it is in movies that this sleight of hand is the most apparent and pronounced, where the mere mortal is capable of superhuman accomplishments, and it is all captured on camera to prove that it really did happen. Here are three trick shots that are from the best pool movies ever made. The beauty of these shots is that they are not necessarily rigged like most trick shots. These are shots that one may encounter in any game. Learning the skills to make these trick shots, and even better yet discovering them on the table, are more helpful for your game than the typical rigged circus-like shots. The more you play the game, the more likely you’ll find yourselves in one of these positions. The most important lesson from these three shots is the use of creativity on the pool table when you find yourself in a tough spot. And if you’ve movie-star looks and acting chops, you might just find yourself on the next list of best pool movies making a trick shot look easy. This 1961 movie is a regarded as the best pool movie ever made. 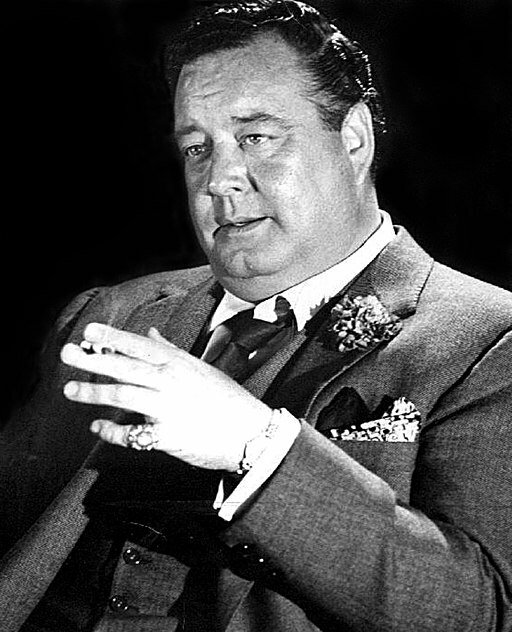 The movie is heavy stuff, and the shot-making by Jackie Gleason and Paul Newman is phenomenal. 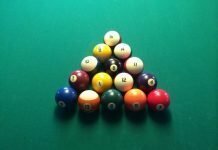 Even though Straight or 14.1 continuous pool is the game of choice in The Hustler and is the currently out-of-fashion, the movie that sparked a resurgence in pool in 1961 still resounds today. In Straight Pool, you have to call every shot, including during the break. 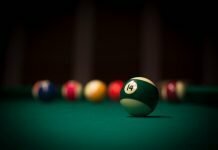 Since that is virtually impossible with 15 balls in the rack, the best players play safe on the break in an attempt to leave the balls as undisturbed as possible and hide the cue as to not leave their opponent a shot. Paul Newman’s Eddie Felson, the Challenger, did an excellent job of just that, and Jackie Gleason’s Fats, the Champ, didn’t have much to work with at the outset of their marathon match. Though it is rare to find a game of straight pool these days, it is not rare to find a setup like this. 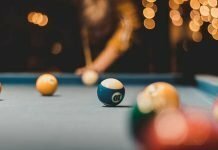 With the popularity of doubles pool and varying levels of skill at most games in barrooms and at home (and alcohol often a part of the equation as well as over-macho breakers who often miscue) sometimes there’s not much a break-up of the balls at the break leaving a still partially bunched-up rack. There’s always the option to re-rack if you’re playing for fun and no balls were pocketed. The shot Gleason makes here is not a trick shot. He assesses the situation and finds a shot in what appears to be a random mess of balls. He calls the six in the corner, and with a firm hand strikes what is probably a four or five ball combo that eventually leads to the six going in the corner and breaking up the balls nicely. What Fats realizes is that the Six is “Dead” in the corner. That means that the ball that it is touching will knock the six in the corner regardless of where that ball is struck, so all he has to do is get to that ball. Realizing when a ball is dead leads to making seemingly unmakable shots at first glance easier than one might think. Finding a dead-ball is a god-send for a player, and the creativity lies in finding them. One can even find dead banks and kisses, making what looks like the impossible into a shot that is hard to miss. It also is a fine looking shot and might you get you called a hustler yourself when you utilize it with those unaware that the ball was dead in the first place. 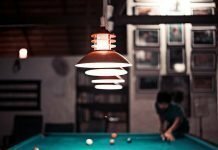 More on famous billiards shots from The Hustler. Vincent Lauria (Tom Cruise) uses masse to put the nine ball in the corner after striking the one ball first. 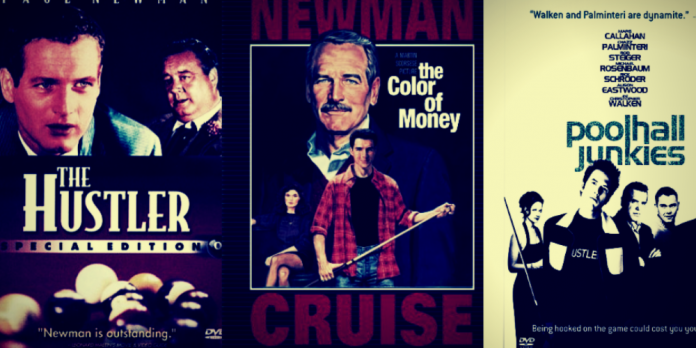 Martin Scorsese picked up Fast Eddie Felson’s story 25 years after the Hustler in this 1986 movie that is a strong second on the list of best pool movies and focuses on the new popularity of nine-ball. Don’t let Cruise’s toothy grin and good lucks and samurai-sword moves after making shot after shot as an up-and-coming hustler fool you. He became a student of the game much like Newman did in in 1961 and most of the shots in the movie are the real-deal. 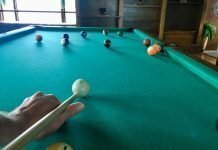 Whenever the nine-ball is perched precariously in front of a pocket it can make for fast action in that game where the yellow-striped ball is the only one that matters. Vincent is seemingly tied behind the one with no shot. Learning how to bend the cue-ball is one of the most enjoyable shots for a beginner to acquire. However, masse shots in this fashion are extremely difficult to control, and should be used rarely. The creativity in this shot is two-fold and similarly to the other examples in this post, it is all in the shot selection. First, even if Vincent didn’t have to bend the cue, noticing you have a look at the nine and ending the game early is key to success in nine-ball. Couple that with an ability to deploy the masse to bend the cue opens up new shots that were previously blocked. They are also one of the best-looking shots when performed correctly. And if you knock down a masse shot for a win, you will most definitely be labeled a Hustler. 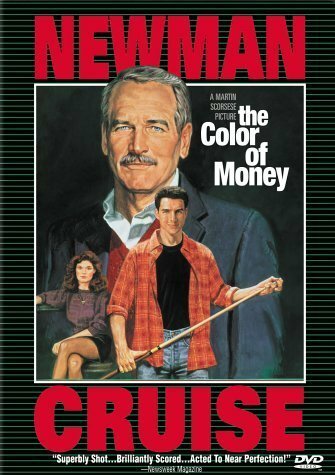 Learn more about billiards shots from The Color of Money. Mars Cunningham wrote, starred in, and directed this 2002 movie, and he is obviously quite the force on the table as well, making some very difficult shots throughout the movie. Christopher Walken steals the show though, and it is his wonderful monologues and his style that really make this movie. He is also a natural at the pool table, at least on-screen, and much can be learned by this shot. The cue is frozen (stuck to) the object ball, in this case the Eight, and both of which are stuck on the rail. This is one of the most difficult setups in pool to pocket a ball. This shot is a perfect example of making a shot when there isn’t one that is readily apparent and one would normally look towards playing “safe”. If the eight were perched in front of the side pocket, one would play a “kick” towards the opposite rail, with the cue coming back in the same fashion that Walken plays it. Kicks are very makable shots once you have them in your repertoire, a good skill to acquire. What the genius of this shot shows though, is that Walken has to put the object ball in position to BE kicked into the side when the cue returns towards the side pocket. That’s the added factor that most players would overlook. It is not hard to barely nudge that Eight enough to have it perch in front of that side, and using the proper speed and angle on the cue-ball and having it return to knock the eight into the side is not a master shot. Shoot it 100 times and you’ll see. The master part is seeing that shot in the first place. Cunningham making the shot one-handed for the big-gamble to follow up is impressive, as shots with the cue on the rail oftentimes require the best-cue stick control with your swivel arm. 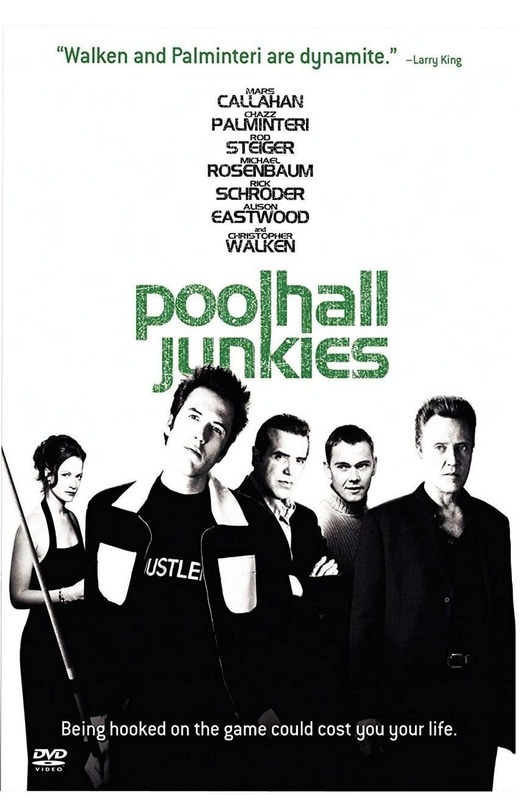 Yes, Cunningham knows his way around the pool table, and PoolHall Junkies is a strong third on any list of best pool movies. See more analysis of the billiard shots from one of the best pool movies, Poolhall Junkies. Hart Fowler is a freelance journalist who currently resides in the beautiful Appalachian mountains of Virginia. 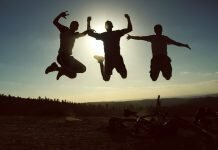 He is the former publisher of 16 Blocks Magazine, and currently writes for Blue Ridge Outdoors, 100 Days in Appalachia, C-Ville Weekly, The Roanoke Times, Raleigh Magazine and many others periodically. He is also a ghost writer, but you have to contact him directly if you wish to discuss that further.